During the 1950s, the Honda Motor Company emerged from obscurity, having survived and won the battle with hundreds of competing postwar motor-bicycle companies. The company had found a first key to financial strength in the successful step-through 1958 Super Cub®, and would now reinvest its earnings in further research, and production plants such as the one built at Suzuka, then the largest motorcycle manufacturing plant in the world. Honda motorcycles of the 1960s can be viewed as intelligent social engineering. Soichiro Honda understood the U.S. market was ripe for the enjoyment of motorcycling, but there were problems to overcome. For instance, the motorcyclist of 1960 expected lighting and ignition troubles in the rain, and accepted the need for the athletic act of kickstarting his mount to life. Hondas put an end to the motorcycle's primitive status with their reliability and electric-start convenience. 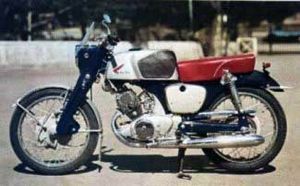 Motorcyclists also had image problems in this country at the time, something Honda blunted with the "You meet the nicest people" advertising campaign in 1962, and with attractive entry-level bikes. Matched to this process was the stairway of models Honda developed during the decade, leading upward from the entry-level 50cc C100 Super Cub toward the ground-breaking CB750 of 1969. Mr. Honda's goal in this was not merely to supply a demand for products, but to create, nurture, and expand that demand itself. America in 1960 had very limited demand for motorcycles, but Mr. Honda had seen that Americans needed recreation and enjoyment of that kind. By making it possible to first try a cute and little Super Cub, he opened the door for something larger. Honda's method was really no different from taking a friend skiing, showing them how much fun the bunny slope is, and then letting nature take its course. Another crucial element to Honda's growth in the 1960s was the company's parallel growth in engineering expertise and sophistication. With new models, Honda showed what the company had learned, and pushed the boundaries of performance in a variety of displacement classes. The 1959 CB92 Benly Super Sport® 125, for instance, was important, for combining electric starting with a sporting motorcycle--a first. More significant to sales were the similarly configured CB72 250 Hawk® and CB77 305 Super Hawk™ twins, introduced the same year of the first manned space flights, in 1961. For the first time, a Japanese motorcycle could offer direct performance parity with an established market fixture, the Triumph 500. The Honda twins revved higher than their competition, and therefore produced unusual power for their displacement. Higher revs were made possible by precision valve drive by overhead camshaft--a feature heretofore reserved only for factory racing engines. This, by eliminating the weight of pushrods and tappets, enabled the valves of Hawk models to operate accurately out to 10,000 rpm, an unheard-of figure in a world accustomed to 6500-rpm redlines. The double-overhead-camshaft CB450 continued this theme of escalated capability. Introduced in 1965--the same year Whammo patented the frisbee, and Craig Breedlove set a land speed record of 600.001 mph--the 450 offered more power again, as always combined with automobile-like reliability, electric starting and effective lighting equipment. As its business plan unfolded, Honda made itself a household name in another forum: racing. Beginning with the Isle of Man team prize for its performance in the 1959 125cc race, Honda expanded its racing success with a 250cc road racing world championship in 1961, followed by many more like it, and culminating in 1966 with Honda's constructor's championships in all five classes, 50, 125, 250, 350 and 500, an international first. Thus the Honda name took its place among the other greats of racing: Norton, MV-Agusta, Gilera, and Moto-Guzzi. The research and development that made these successes possible went hand in hand with new-product research, and each served the other. Honda research explored such things as complex casting technologies, combustion at ultra-high rpm, and low-cost but high-performance materials. Such explorations were also crucial to Honda's engineering growth, but not just in driving machine capability ever higher. Honda manufacturing was completely different from methods considered normal in European motorcycle factories in 1960. Honda introduced design for manufacturing, by which the speed and economy with which parts can be made and assembled is considered and provided for early in the design process. Engine internal parts were laid out sequentially in one crankcase half, then the other half was closed over it. Parts assembly was rational and easy--both on the assembly line and in service. All of the elements--engineering for performance and reliability, racing experience, sophisticated design for production purposes, and the stepladder up to higher-displacement models--came together in a single motorcycle in 1969, the year of Woodstock, "Abbey Road," and man's first walk on the moon. As the riding public readily accepted the larger models, it became clear the time had come to assert Honda's leadership in the largest-displacement category. Because racing success with four-cylinder machines had given worldwide special meaning to the words Honda Four, the new machine would have to be just that. Honda's CB750 was the top of the scale, the pinnacle of the ladder of motorcycle models the firm had so carefully constructed throughout the 1960s. It offered high performance and the capacity to carry two people and luggage long distances, combined with all the expected virtues of previous Honda machines. Above all, it personified the dream and tradition of the Honda Four, with its flashy bundle of four exhaust pipes. Other manufacturers had attempted or planned four-cylinder machines, but their complexity was too much for existing manufacturing methods. 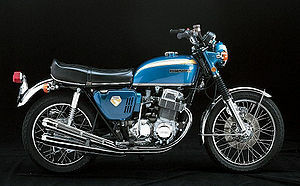 The CB750's engine was air-cooled, with a single overhead camshaft, and was assembled by Honda's usual horizontal-split crankcase system--with a difference. Instead of the complex, multi-piece rolling-bearing crankshaft of previous Hondas, the big 750 had a one-piece forged crank, supported in automotive fashion by pressure-lubricated split-shell plain bearings. This not only made the crankshaft stronger, it also saved valuable production time and expense. The crankshafts of all four-cylinder sport bike engines today are made and supported in exactly this fashion. Throughout the 1960s, Honda built success upon success, strength upon strength. In a single decade the firm went from offering products to a purely domestic market to international distribution, with eight distributors worldwide. 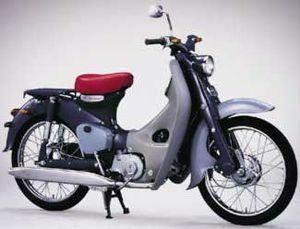 Honda began the '60s with 50cc step-throughs, and ended the decade with 750cc fours. U.S. sales rocketed from a mere 3200 units in 1960 to an astonishing 345,000 by the end of the decade. On the way up, Honda revolutionized motorcycle design and production. It single-handedly created the modern motorcycle market in the United States by skillfully overcoming motorcycling's traditional shortcomings, and then by shrewdly creating a demand for products that went up the ladder in displacement, performance and sophistication. In the 1960s, Honda took us all up that ladder. It's a journey that continues to this day.